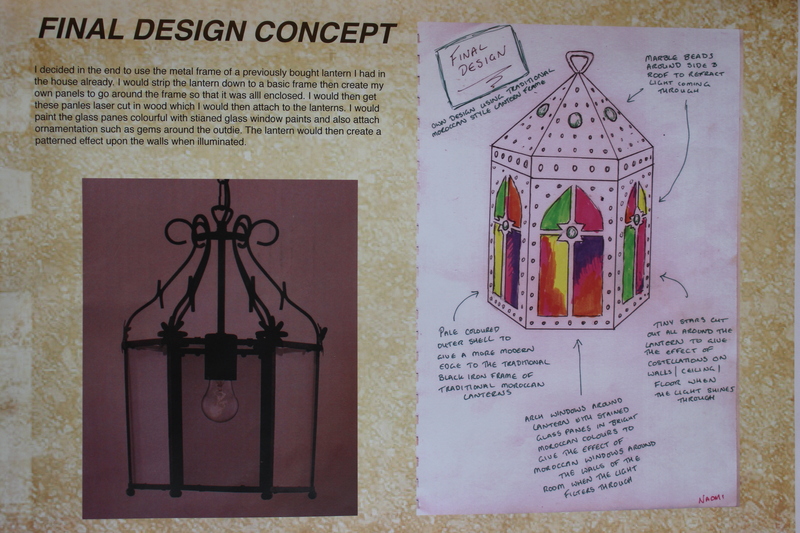 For my Interior detail design project I decided to make a Moroccan lantern that would be a feature in my cafe I had designed for the previous project. 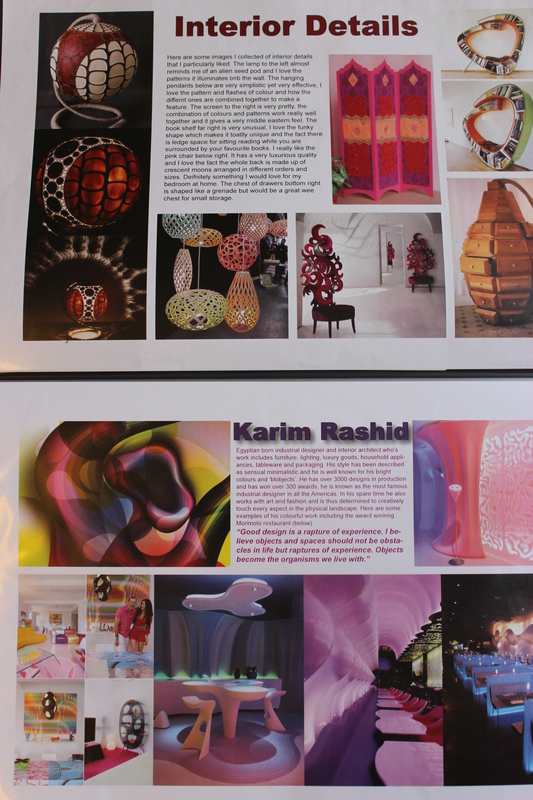 Before I had decided on doing the Moroccan lantern I researched some unusual interior details as well as looking up some creative practitioners and the way they went about their creative process including Karim Rashid, Louise Campbell and Andreas Kowalewski. I really like Karim Rashid’s work as he employed a lot of different colours and organic shapes in his work and also believed that design was a ‘rapture of experience’. I also looked at Louise Campbell, an upcoming designer who did a lot of unique intricate patterned lampshades. She described her inspiration for a lot of these lampshades as being like nature, the way light would filter through the leaves to a forest floor. Andreas Kowalewski designed one particular lamp shade which was not only unique but based on an intricate pattern. These designers helped inspire me with their use of colour, pattern and methodology. The fact that they were inspired by nature and everyday life. That their work was colourful and organic. 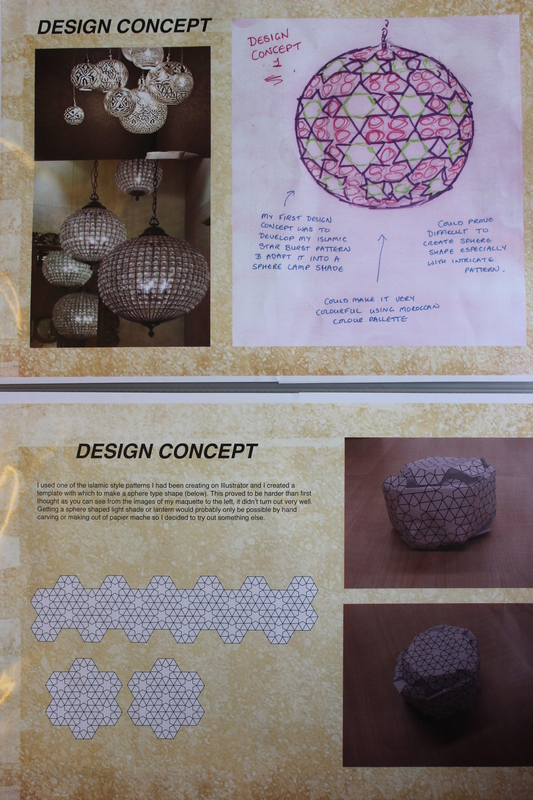 I also researched different types of Moroccan lanterns to get some ideas of what I could do for my own design. I had recently been to Morocco and had first hand experience of seeing the traditional lanterns being made. The thing that fascinated me about them most of all was how the different coloured glass and ornate patterns in the iron work cast beautiful illuminations and pattern across the walls when lit up. I decided I wanted to do my own unique take on this but also bear in mind that my lantern would cast pretty patterns and coloured light across the walls when it was illuminated. After looking at different types of Moroccan inspired lanterns and light shades I discovered they not only came in standard hexagonal and square box type shapes but also in many different shapes including cylindrical, diamond and even star shaped. I started to think about how I could recreate different shapes for my lampshade. I began to jot some ideas down of my own. 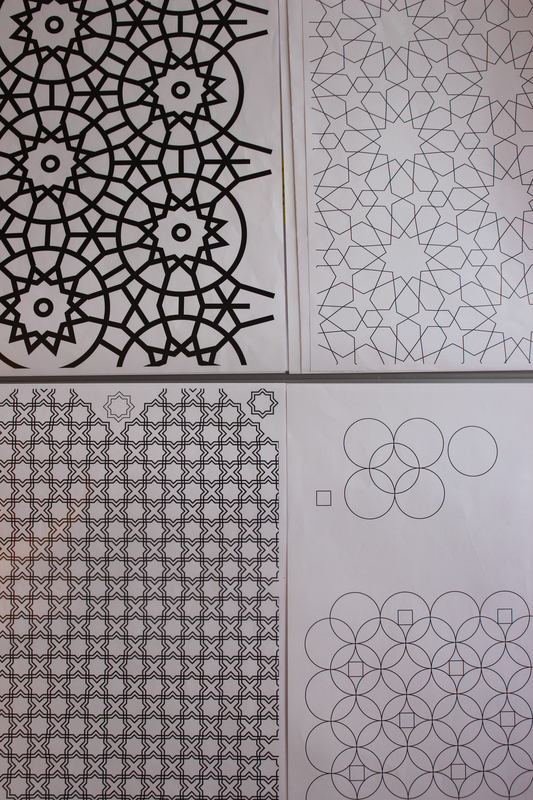 I started researching Islamic geometric patterns, mainly star shapes and sunburst patterns, and I began designing my own patterns using Adobe Illustrator to see if I could come up with something that I could use in my lantern design. I experimented with a few maquettes I’d made using shapes and an islamic-style starburst pattern I’d created on Illustrator, I found that i was having trouble creating the exact style and pattern that I wanted with the facilities that were available to me. I ended up going back to the drawing board and I thought I could possibly upcycle an old lantern and put my own design on to it. I had an old hexagonal style lantern at home with a metal frame and 6 glass panels that I could use so I started to work on my redesign for this. I experimented with different patterns I could use on each of my panels on Illustrator and eventually came up with a final design. I then came up with my final design using Adobe Illustrator and I made up PDFs to cut out all my final design panels on MDF using the laser cutter. 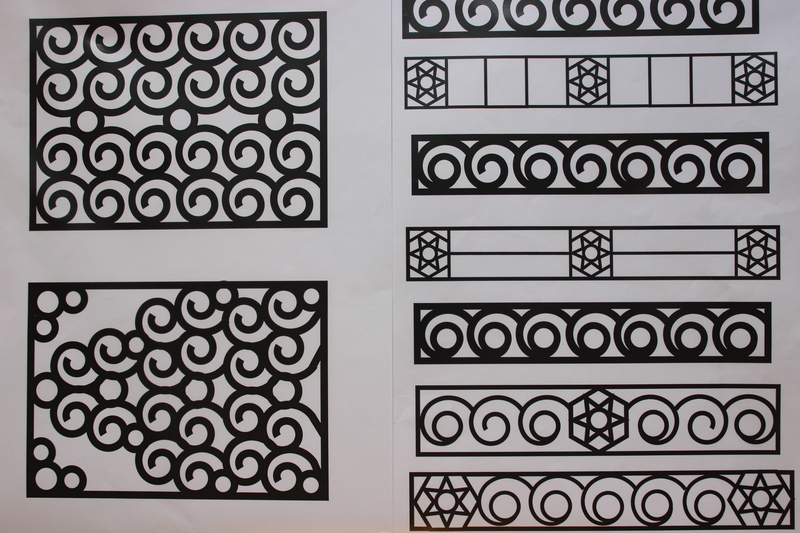 Below I’ve made up a slideshow so you can see the progress of putting my Moroccan lantern together. Overall I think my lantern turned out very effective. It looked good when it was illuminated and the light cast out patterns and coloured light as intended. It also looks good even when not intended as the paint effect does make it look like old stone. The whole process took a lot longer than expected with a few problems along the way, for example lack of childcare meant not being able to use the glass paints and the fact I had to go over the lantern with plaster and undercoat a number of times. 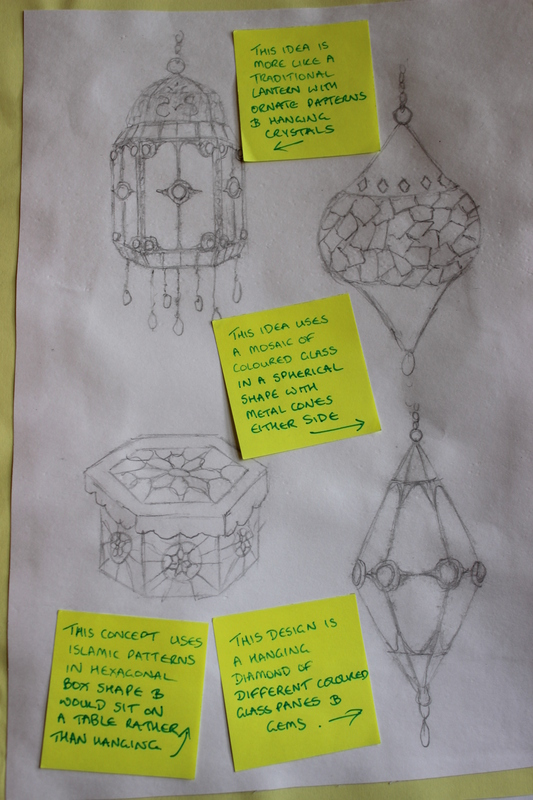 I think if I had the chance to this again I would have probably worked a bit more on my other ideas I was working on during the creative process and come up with something more unique using different shapes and the islamic sunburst patterns I was working on.